LeBron James is one of the many stars featured in the new campaign. 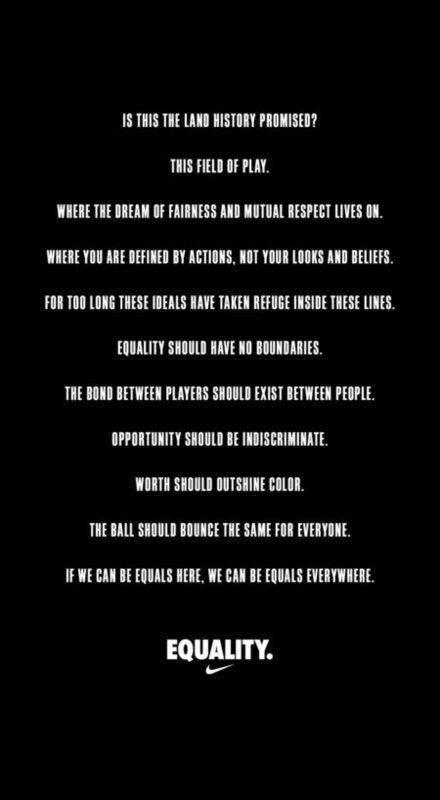 Nike is using its platform as one of the biggest sports brands in the world to tout a message of equality. The brand has launched a new 90-second spot, from Wieden + Kennedy in Portland, that “encourages people to take the fairness and respect they see in sport and translate them off the field,” according to a release. The ad, which was was directed by Melina Matsoukas, best known for her music videos, was released ahead of tonight’s Grammys broadcast on CBS. It features stars like LeBron James, Serena Williams, Kevin Durant, Megan Rapinoe, Dalilah Muhammad, Gabby Douglas, and Victor Cruz. Actor Michael B. Jordan appears briefly and provides the ad’s voiceover. The soundtrack is a new recording of Sam Cooke’s “A Change Is Gonna Come” from Alicia Keys, who can also be seen in the spot. The campaign will be promoted through Nike’s social channels as well as with avatars and filters for people who support the message to use in those channels. It will also have billboards and posters in U.S. and Canadian cities. Check out a behind the scenes video of the spot and some print work below.